Brasília (AFP) - Brazilian President Dilma Rousseff said Wednesday she was the victim of a coup as her allies horse-traded frantically for enough votes to ride out an impeachment drive. 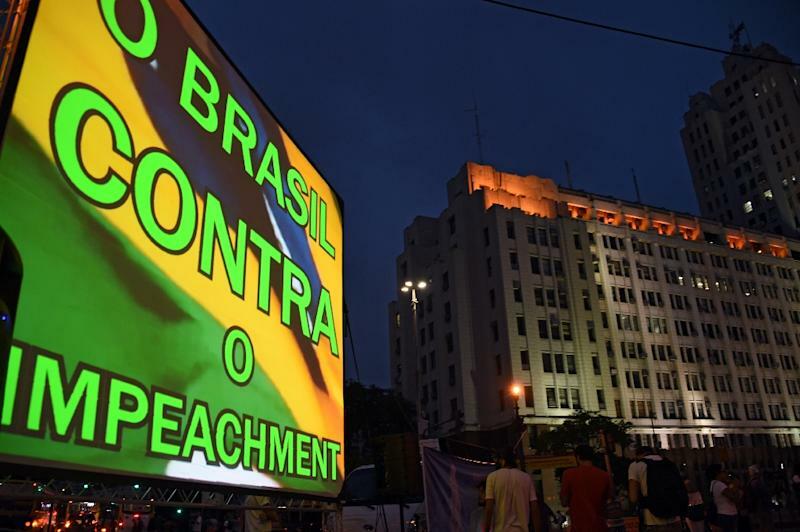 "Impeachment is a putschist process that is out of line with the country's trajectory since returning to democracy," Rousseff said in a speech in Brasilia, referring to the end of Brazil's two-decade military dictatorship in 1985. A months-long crisis reducing Latin America's biggest country to political paralysis ahead of the Rio Olympics deepened Tuesday when Rousseff's leftist Workers' Party lost its main coalition partner. That leaves Rousseff isolated as she tries to survive impeachment in Congress against a background of punishing recession and a corruption scandal at state oil company Petrobras that has snared a cross-section of the country's elite. A poll from Ibope showed approval for Rousseff's government remains around record lows of 10 percent, while her personal approval rating was 14 percent. According to Rousseff, she has broken no laws that meet the standards for impeachment. The potentially lengthy process is already under way in a preliminary commission and the lower house of Congress could vote as early as mid-April on whether to send the case to the Senate for full trial. UN Secretary General Ban Ki-moon expressed his concern, telling O Estado de Sao Paulo newspaper that "any political instability in Brazil is a reason for worry." To impeach Rousseff, 342 out of 513 deputies must vote in favor. If Rousseff managed to get 171 votes or more, she would defeat the measure, but it could also fail through abstentions or deputies not attending. Until only recently Rousseff seemed likely to narrowly prevail, despite her unpopularity and the intense hostility of opponents in the increasingly divided country. With the centrist PMDB's exit from the coalition, the math gets far dicier. Put another way, the government now potentially has seven ministries and some 580 other posts to hand out and is ready to horse-trade for support. How that reshuffle will go is unclear, with the remaining PMDB ministers still in their government posts. However, one significant ministry was freed up when the sports minister, George Hilton, resigned, even if he was not from the PMDB. An interim replacement was named. Rousseff hopes her main weapon will be her predecessor, the charismatic and authoritative Luiz Inacio Lula da Silva -- a renowned wheeler and dealer. However, after being accused in the Petrobras corruption scandal, Lula has also become a focal point for opposition attacks, making it questionable whether he helps or hinders Rousseff more. The strategy will be to look beyond the PMDB to the multitude of smaller parties in the fractious Congress and to individual deputies, regardless of their affiliation. At the same time Rousseff needs to keep together the rest of her coalition, with most attention being focused on the PP or Partido Popular, which has said it will announce its position within days. A parallel strategy, analysts say, is to persuade deputies to abstain. A cross-party commission is hearing arguments and is expected to make its recommendation on impeachment on or about April 12. 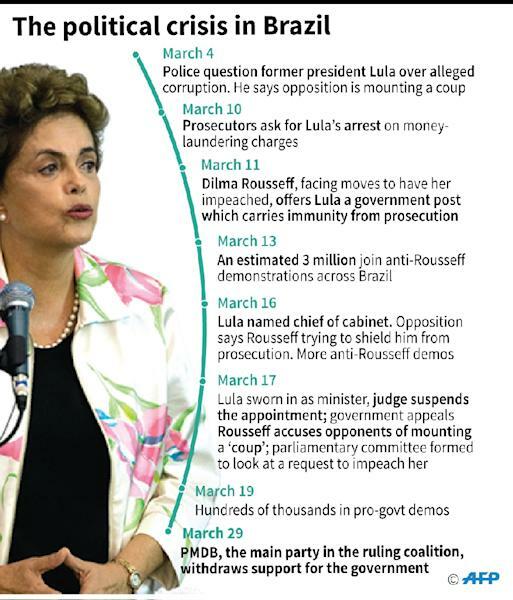 Rousseff's defense is already expected to wind up on Monday. The lower house would then debate and could vote April 14-16, according to a preliminary estimate of the timetable. If deputies do send the case to the Senate, then a process possibly taking months begins. 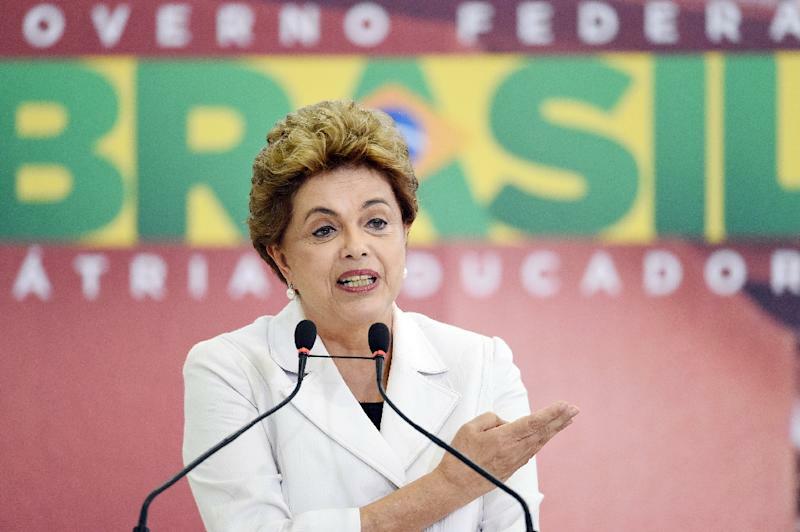 A two-thirds vote would again be needed to depose Rousseff. While Congress fights, ordinary Brazilians are becoming increasingly angry over the dismal economy and the constant drip of corruption revelations. Demonstrations against and in favor of Rousseff and Lula are multiplying, with Workers' Party activists planning to hold rallies in major cities Thursday. Lula was expected to lead the Brasilia protest. Rousseff cancelled a trip to Washington for a nuclear safety summit on Thursday and Friday, the state news agency said. A government spokesman said that attending was not advisable in "the current political context."